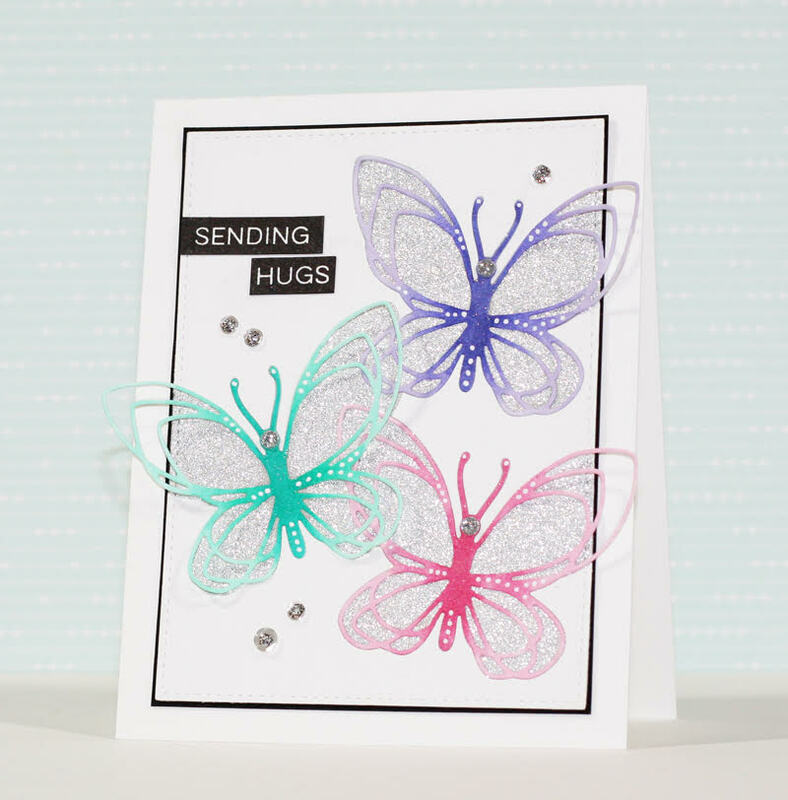 For my first card I used the Floral and Flutter dies from Concord & 9th to create a sparkly, ombre butterfly design. I diecut three of the butterflies and then I coloured them all in with various shades of Copic markers to create an ombre effect. This has bene one of my favorute things to so lately with diecuts.. I love the graduated colour on the deisgns. To create the panel so that the glitter would show through under the butterflies, I diecut three butterflies from a white cardstock panel (overlapping them in in places) and then I fit all of the pieces back together over the silver glitter piece, adhering each piece as I went. I used the negative pieces on the white panel and the butterflies that I had previously diecut and coloured. Once I had all of the butterfly pieces adhered, I added the panel to a black cardstock mat and then added it to a top-folding white card base. 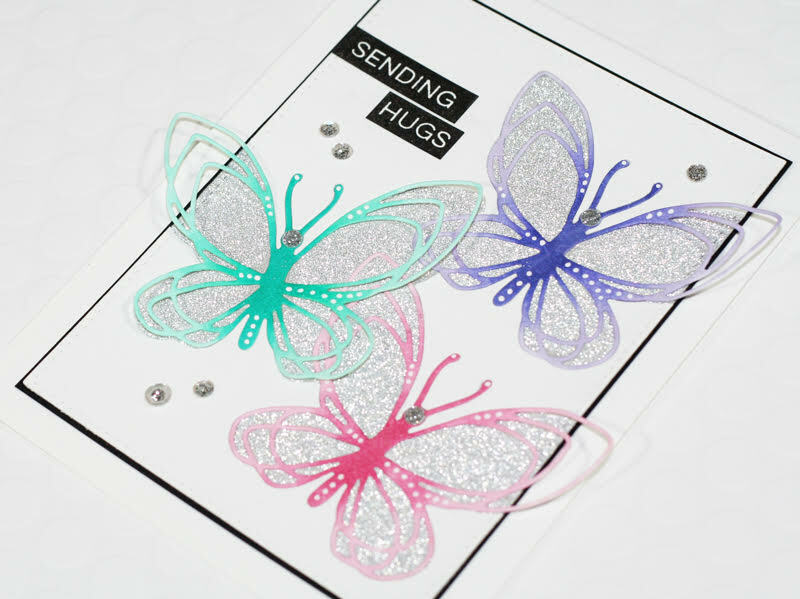 I completed the card by adding the sentiment using the MFT label Love stamp set and I added some clear sequins and white gel pen detail to the butterflies. For my second card I used the adorable new Better Together stamp set from Neat & Tangled to create a little scene with the cute images from the set. I stamped the images in black ink and then coloured them in with Copic markers. I then cut them all out with scissors (I didn't want a white border around them) and adhered them onto a white cardstock panel. 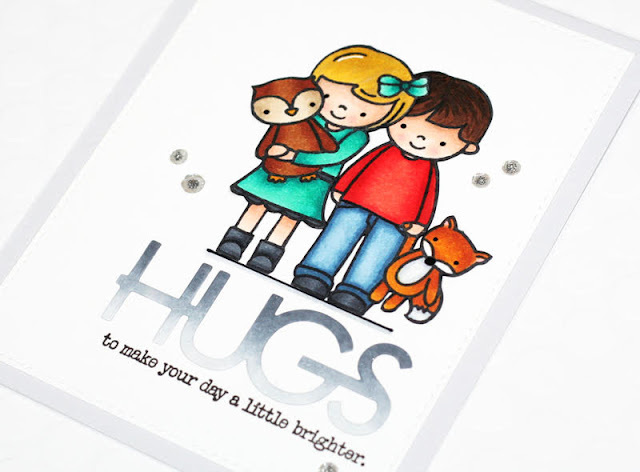 I diecut the words 'hugs' from Papertrey Ink and I coloured it in with various colours of grey Copic markers to create an ombre effect. I love the soft fade of colour. To finish the card, I stamped the second part of the sentiment directly under the diecut word, with black ink and then I added some clear sequins scattered around the image. I adhered the finished panel onto a grey top-folding card base. Thanks so much for stopping by today! Be back soon!